Polish label specializing in dark ambient/neofolk/industrial/experimental/militaria. Originally the enterprise was called War Office Propaganda: The label owners Marcin Bachtiak and Robert Marciniak changed the name in June 2007 to Rage In Eden as a new chapter in the labels history. 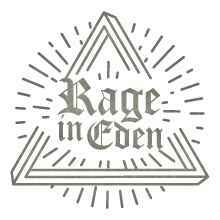 On October 3, 2018, due to personal issues, the activity of Rage in Eden Records has been put on hold for indefinite time.